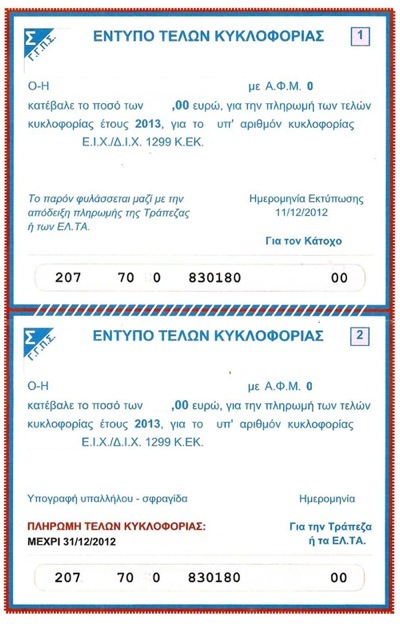 Circulation tax or τέλη κυκλοφορίας (teli kykloforias) applies to all vehicles with Greek license plates, which are registered at the tax office as active. It is a road tax paid to use a vehicle on a public road, known in other countries as a registration fee, motor tax or excise duty. In a bid to cut approximately 80 million euros in costs, no printed tax invoices are sent by mail and no stickers are issued as proof of payment from November 2012. *Article last updated on January 6, 2015. How to withdraw a vehicle from circulation. Circulation tax is calculated according to engine capacity, and rates are subject to change annually. Rates for 2013 and 2014 were unchanged. Road tax for taxi cabs is calculated at a higher rate, and a 10 percent surcharge applies to trucks/lorries and buses. Using the vehicle’s age as a criterion was abolished on January 1, 2011. All vehicles registered after 2002 with an engine capacity over 1929 cc will be assessed a luxury tax from 2014, which can be found under ‘Υπηρεσίες προς Πολίτες à Φόρος Πολυτελείας’ on the gsis.gr website and printed if they didn’t receive a notice by mail. It must be paid by January 31, 2015 this year. First read, “Registering your car in EU countries” to determine if and when you need to exchange license plates. Not all vehicles need to be registered. It depends on your citizenship, length of stay, residency status and reason for being to Greece. Also helpful: “Importing a car into Greece” and first-hand information on customs and circulation tax from Eri, found below in Comments on February 7, 2014. Deadline to pay every year is December 31 for the following year. For example, the last day to pay 2015 fees is December 31, 2014. Many wait to the last minute and insist on paying cash, which creates long lines at banks, post offices and tax offices after Christmas. An extension ’til January 5, 2015 was announced on December 31 for 2 million people who still hadn’t paid on the last day, supposedly “due to weather” even though payment can be made in minutes from the comfort of home. Parliament was dissolved shortly thereafter for snap elections, so no further extension is possible. 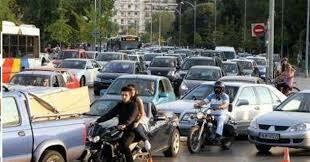 In 2013, some 29,000 people did not pay or submit paperwork to withdraw vehicles from circulation. In 2014, that figure skyrocketed to 200,000 with only 5.37 million vehicle owners paying their bills on time and generating over 1 billion in tax income for state coffers. *Tax offices are closed on December 25, December 26 and January 1. The penalty for paying late is double the circulation tax. The bill has two, non-identical parts — the first being for the vehicle owner, and the second for the bank or post office if making payment at these locations. It shows the name, AFM, amount due and the license plate number (circulation number)* in blue text and the payment code at the bottom in black. *Elements were removed to protect the privacy of person who allowed me to scan it. Circulation tax invoices are available online at TAXISnet via gsis.gr as of early November each year, though there is typically a delay due to Greece being Greece. *Note that the Ministry of Finance has not changed the date from 2012, but the link is correct and the system is working. 1. Go to Εφαρμογή Εκτύπωσης Τελών Κυκλοφορίας Αυτοκινήτων. 2. Press the blue ‘ΕΙΣΟΔΟΣ‘ button. 3. Enter the ‘ ΑΦΜ‘ (AFM/Greek tax number) and ‘Αριθμός Κυκλοφορίας‘ (Arithmos Kykloforias/circulation number aka, license plate number) of the vehicle you wish to access. 4. Press the ‘Αναζήτηση‘ button to request the invoice and verify that the AFM and license plate number match records in the database. 5. If they match, the message in red will say: ‘Επιτυχής αναζήτηση. Πατήστε Εκτύπωση‘ (Search successful. Press Print). 6. Press the ‘Εκτύπωση‘ (Print) button. It allows you to view and print (if connected to a printer) or save as a PDF by clicking the download button on your browser window. You can print more than once, if necessary. If the database returns an error or no match is found, you need to contact the tax office to update or correct the vehicle’s records. Taxpayers can also access their records at gsis.gr with their TAXISnet username and password, but the method above is quicker and easier. *Greece first announced its intention to implement an online system in 2010, but it did not go live until December 23, 2011, which was too late for the 2012 year. In 2013, the system experienced problems and the availability date was changed four times. No Internet access, no printer? d) visit a post office in Greece with your AFM and license plate number. Certain banks, such as Alpha, Piraeus Bank, Eurobank and TT Hellenicbank, also offer the option to retrieve your invoice and online payment code, with only your AFM and license plate number. Those with Internet access but no printer can look up the payment code, then pay online or by phone without needing to print an invoice. Post offices. See, “Find a post office” at the official ELTA website. Many locations will be open late to accept payments on December 30 (20:30) and 31 (18:00). Banks: In person, via ATM and by phone. Which ones? Contact the bank in Greece you do business with and proceed from there. Less than 7 percent of vehicle owners pay circulation tax via e-banking. 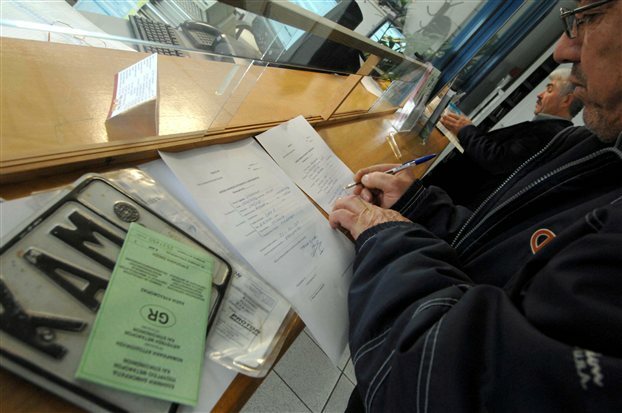 Silver-and-blue stickers or σημάτα (simata) — known to some as a tax disc or vignette — are no longer issued as proof of payment, but police vehicles equipped to access database information will be able to verify if the owner of a truck, car or motorcycle/motorbike has paid circulation tax using the license plate number. Those who paid in person at the tax office, post office or bank should keep their receipt; and those who paid online or by phone are encouraged to keep a bank statement or other evidence at hand. Not all police vehicles have the relevant technology. Persons who cannot or do not wish to pay the road tax can withdraw their vehicle from circulation. d. Το αποδεικτικό ότι έχουν πληρωθεί τα τέλη του 2013/Receipt proving you paid circulation tax for 2013. All past taxes must be paid as a prerequisite. e. E9 statement showing that you own or rent a space to park the stationary vehicle. If you do not own or rent a parking space, a friend or relative with a parking space can sign a dilosi stating they are letting you use theirs and have it stamped at the police station. Present this along with a photocopy of their E9. It is not necessary to have insurance on a withdrawn vehicle. At the tax office, you’ll be asked to fill out an application. Tax offices typically keep licenses plates for one year. However, given the economic climate, the Finance Ministry announced on January 2, 2013 that plates would be stored indefinitely to reduce state costs and eliminate bureaucracy for those wishing to put vehicles back in circulation beyond 12 months, which can be done by simply paying that year’s road tax and picking up the plates. — the license plates are destroyed (though they often keep them longer). If they destroy them, you apply to the Ministry of Transport and tax office to issue new license plates and pay a small fee. Since the recession began in 2009, a steady and increasing number of vehicles have been abandoned or withdrawn from circulation and the road death rate has fallen to 1974 levels. A half million licenses plates have been surrendered to date. In the interest of transparency, I do not own a vehicle in Greece. This article is based on extensive research and translations I performed, plus three friends who granted me access to private information about their cars, tax information and recent/past experiences. I will not ask them to answer questions from readers. Billing errors, tax questions and further information on withdrawing a vehicle from circulation should be directed at the tax office. Banking inquiries and those needing payment assistance should seek out customer service. There’s no way I (or anyone) can cover how Greek tax and road laws harmonize or contradict every country’s laws and advice specific to your situation and vehicle. That would require a website dedicated to this one subject and an enormous amount of time to keep updated. Actual experience and corrections that may enrich this article and help others are welcome. I primarily use Greek-language sources and first-hand experience because official websites and English-language newspapers give little detail, are often incorrect and rarely match what happens in real life. — First-hand information from friends C.T., Y.M. and N.K. Hi, thanks for this excellent information. I know you ask we go to tax office for further information on withdrawing a vehicle from circulation, but we foreigners all know what an awful, time consuming and painful experience this is. So was wondering if any readers have any idea or information on what happens if you ‘withdraw your vehicle from circulation’ and as you say, the plates get destroyed. What happens then, say after the year end or following years. Can the car be ‘back in circulation’ or can it be scrapped? Or used for a ‘withdrawal’ discount against a new or newer car? Or it is stuck in your (or your friend’s or relatives) driveway or land forever? (I mean who knows here in Greece??). An if any of the above are possible, what (countless) documents and payments/charges are involved? Thanks in advance for anyone who has some knowledge of this situation and takes the time to explain. Cheers and Happy New Year to you and all your readers. Bureaucracy is burdensome for all persons in Greece, not just foreigners. 1. The section is about withdrawing it from circulation, but please read what it already says about taking it out. If I ever compile information about putting it back in circulation, a different article will be linked as this post is 1500 words. If the vehicle is ‘stuck,’ that’s on the owner since he/she decides what to do with it and is responsible for taking action. I also notified people in November on the Twitter news feed @livingingreece, which many find helpful. Nice to see you again, and always a pleasure to help people who have given back to the website. great site, priceless info, but i can’t find out how to print a form for a moped, could anyone help me out? Thank you for sharing that info. I’ll add a note to the article. All best! Hi Kat, I have a hybrid vehicle and my circulation tax was zero this year! Well, that’s what was printed on my form. I printed it off and carry it in my glove compartment. Hope I read it right but last year I paid 6 euros for the year. We were not informed that the road tax 2013 has to be paid until 31st december 2012. Our tax for the moto is Euro 22 and according to the new rules, the tax is double if not paid in time. We cannot understand why we had to pay Euro 52 (instead 44) at the tax office in Paros ! The people there could not explain why we have to pay the extra money !! Circulation tax is due every year at the same time, so it’s a known deadline. Also, paying double for paying late is not a new rule. That’s always been the case. What about the roules for this/next year??? I had to pay the dubble tax as a fine due to I didnt were i Greece November – January. How to fix this??? My bank, Emporiki/Alpha, dont want to help due to they dont know the new roules. Leaving Greece end Oktober, coming back May. Do you mean gsis.gr or webbanking at my account in Alphabank? I think I can log in at gsis, and get the bill via my AFIMI and plate number. When, is it possible to print out the bill of cirkulation tax for 2014 ? Banks don’t know because no one knows yet. New rates are posted later this year, and the article will be updated accordingly. You can make arrangements to pay online. It’s not necessary to physically be in Greece to pay circulation tax. I already answered this question. See the second sentence in Answer 2. The option to print circulation tax invoices and pay online only began last year, so a “norm” hasn’t been established. Also, this is Greece – anything can happen. All articles are updated on a rolling basis from daily news, so I’ll change the article when announcements are made. *Future redundant questions will be deleted. I own a 1962 S2 Land Rover. I am considering transferring it from UK to Greek registration. I have been trying to find out if the zero Road Tax for vehicles over 25 years old applies in Greece as in the UK. Do you have any information? Question is already answered in the article above. In section, ‘How much will I pay?’ it says that a vehicle’s age was abolished as a criterion. Therefore, road/circulation tax will apply. I have recently driven back to the UK in my Greek car and now wish to take it off the road and scrap it. Is there a way of withdrawing a vehicle from circulation without being in Greece?? Much appreciated. As it says in the article above under ‘Withdrawing a vehicle from circulation,’ you need to appear in person and turn in your plates plus show proof that all tax had been paid to date. I understand you couldn’t have driven back to the UK without plates. Be aware that I cannot advise you because I don’t know the procedure for scrappage in the UK and how it harmonizes (or not) with what’s normally required for GR (license plates and #1-6 under section ‘Steps’ at “Vehicle withdrawal in Greece.” Therefore, you need to call the Greek tax office/eforia and ask. Thanks once again for up to date information regarding circulation tax. Today I had been trying the taxisnet site with no joy, probably due to my very limited Greek. Checked Living in Greece and have now printed all my paperwork. Excellent! Feels good to be self-reliant, doesn’t it? Love to hear stories like this. Thanks so much for your comment, and all best. Internal error: Cannot obtain XAConnection weblogic.common.resourcepool.ResourceLimitException: No resources currently available in pool inc00DS to allocate to applications, please increase the size of the pool and retry.. at weblogic.common.resourcepool.ResourcePoolImpl.reserveResourceInternal(ResourcePoolImpl.java:591) at weblogic.common.resourcepool.ResourcePoolImpl.reserveResource(ResourcePoolImpl.java:343) at weblogic.common.resourcepool.ResourcePoolImpl.reserveResource(ResourcePoolImpl.java:330) at…. and so on. Austerity seems to be hitting their webserver resource pools too. Go figure! GSIS has been known to crash intermittently due to overload or other unknown reasons. I tried it a few minutes ago and it was fine. Thanks for your quick responce response to my question.Ihave asked a few people and they say that the car is taken from when it was first registered hear here in Greece. Now we are thinking of selling it if we can. Thanks again. Any car registered after 2002 with engine capacity over 1929cc is assessed luxury tax, so it doesn’t matter if it was 2004 or 2012. The age of the car is not a factor, as stated above in section ‘How much will I pay?’ It is determined by engine capacity. If you have further questions, best to inquire at the eforia. I recommended that you inquire at the eforia because everyday people, Greeks and non-Greeks alike, often have no idea about what the law says and will make up an answer. You will seldom hear the words, “I don’t know” or “I’m not sure.” All best.